Emily Groeteke, right, with her grand champion steer. Emily Groeteke of Cedar Rapids and Connor Rankin of rural Newman Grove were big winners at the 67th annual Norfolk Beef Expo held Sunday, Sept. 11, at the Chuck M. Pohlman Agriculture Complex, Norfolk. Groeteke showed both the grand champion steer and the reserve champion heifer. 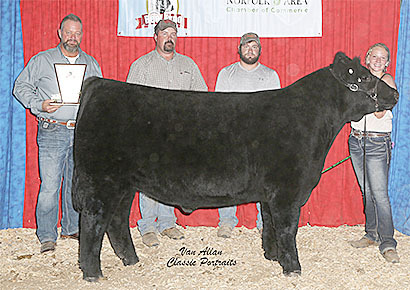 Rankin showed the grand champion heifer. Both are involved in Boone County 4-H programs.